Shopping for 101 Dalmatians Statues? Beautifully handcrafted and delightfully decorated in time-honored folk art motifs, Jim Shore's charming miniatures capture the essence of beloved Disney characters. Lucky wags playfully in a box in this scene from the Walt Disney animated classic 101 Dalmatians. 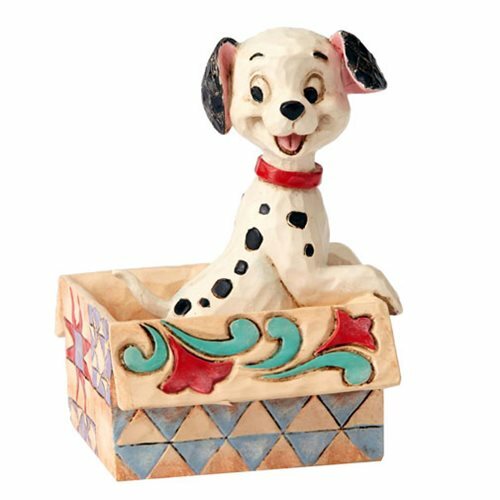 The Disney Traditions 101 Dalmatians Lucky in a Box Mini Statue is made of stone resin. Measures about 2 7/8-inches tall x 2 1/4-inches wide x 2 1/8-inches long. Ages 13 and up.